This section is personal in nature, an annual trip my lovely wife and I make to the Central Coast of California, near San Simeon. 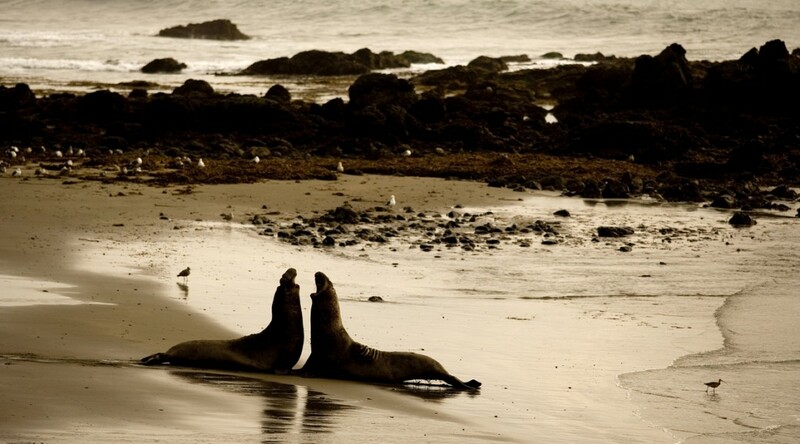 In January, the beaches are chockablock with Elephant Seals – mating, fighting, giving birth – which is quite a show. And that part of California is relentlessly beautiful. Finally, the best part: not a lot of people! Along Highway One, just north of San Simeon, along California’s Central Coast. The Piedras Blancas Lighthouse, still in use, with multitudes of Elephant Seals residing nearby. Pelicans cruising for a meal near San Simeon. A female Elephant Seal with her pup, plus the ever-present seagulls looking for afterbirth to feast on. A female seal basking in the afternoon sun. There are many buzzards along the Central Coast. A lone buzzard looking for an errant varmint between the beach and the Coast Highway. Elephant Seal males constantly battle each other for control of their harems. Each one can have as many as 60 girlfriends. The beautiful coastline of California’s Central Coast, this area being just south of Big Sur. Female Elephant Seals often fight for real estate. December and January is mating time for Elephant Seals. A female Elephant Seal up close.